my Etsy shop as a 5x7, an 8x10, and a 12x18. In December of 2005, the Palinode and I took a trip to Costa Rica with his parents (which you will find stories about in my January 2005 archives). A roll of film from the tail end of that trip just resurfaced last week when I opened up my Canon Rebel 2000 SLR and accidentally exposed a length of the film. I took the roll to my friend of Brock Photography fame anyway, and a few of the photos from that trip managed to turn out. During our last day in Costa Rica, the Palinode and I decided to go to Zoo Ave (ah-vay) in San Jose. I do not know why we chose to go to a zoo, because we had just come down from ten days in the mountains where most of the vegetation and animals could be seen for free and in their natural habitats, but to the zoo we went. 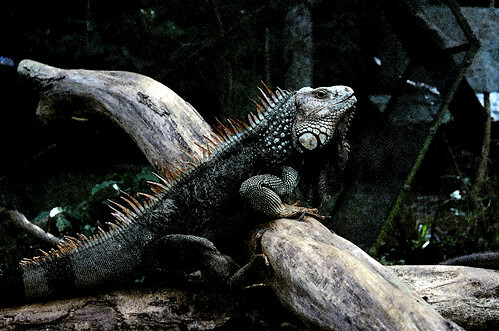 The iguanas in the exhibit were huge and mean-looking, especially the one pictured above in particular. If he had been human, the police would be digging up three generations of neighbourhood children in his back yard. The Palinode eyed that beastie and bobbed his head up down, and the thing eyed him right back and bobbed in return. This went on for a couple of minutes before I fully realized that the lizard was taking this as a challenge to fight. Thank gawd for stone walls and the iguana's limited ability to jump.